Industrial style meets functionality with this round cocktail table. Kick your feet up and relax or place a tray and some decor on top, this piece serves multi purposes. The brown tufted leather with hex nut details make this a standout table that will help complete the look in any industrial style room. The Intermix Industrial Round Cocktail Table with Tufted Leather Top by Hammary at Jordan's Home Furnishings in the New Minas, Halifax, and Canning, Nova Scotia area. Product availability may vary. Contact us for the most current availability on this product. Add a touch of modern industrial style to your space with this collection of tables. 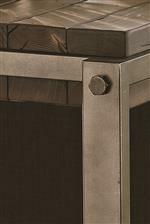 The unique design of the naturally distressed reclaimed pine being suspended by the burnished silver metal finish is what makes these tables stand out. Inspired by straight forward design that is more about function, this collection can change the feeling of your room. The Intermix collection is a great option if you are looking for Industrial furniture in the New Minas, Halifax, and Canning, Nova Scotia area. Browse other items in the Intermix collection from Jordan's Home Furnishings in the New Minas, Halifax, and Canning, Nova Scotia area.